There are two types of web applications which may be developed with Echo3: applications whose code is executed on the client, and applications whose code is executed on the server. Server-side Echo applications are written in Java (other languages may be supported in the future). A server-side Echo application communicates with a special "thin client" Echo application that is provided by the framework itself. This thin client application synchronizes its component state to that of the server-side application, and sends any user-generated events back to the server. A server-side Echo application may communicate more directly with its datastore, calling into a Java middle tier directly and/or using such protocols as JDBC, RMI, LDAP, or XML-over-HTTP to remote servers (rather than only to the host server). Feedback on this documentation is greatly appreciated. If you find yourself struggling with a particular section, please let us know so that we may improve the situation for future readers. 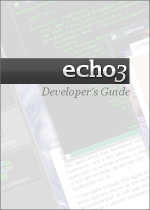 If you have suggestions, please post them in the Echo3 forums at http://echo.nextapp.com/site/forum.